"Don't put that turkey in the oven yet! Inject it first! 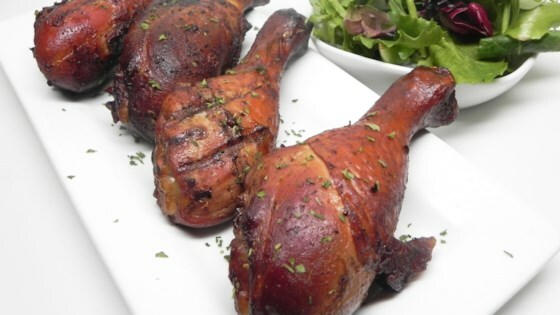 This marinade injects a rich and buttery flavor directly into the meat of your turkey." Combine beer, butter, salt, Worcestershire sauce, hot pepper sauce, soy sauce, garlic powder, and onion powder in a saucepan over low heat. Stir until salt is dissolved and sauce is even and runny, 5 to 10 minutes. Keep marinade warm (but not hot) to inject. The secret to using this injection marinade is to keep it just warm enough for the butter to stay liquid. Use a flavor injector tool to inject warm marinade into every inch of a 15-pound turkey's breast, thighs, wings, and drumsticks. Pour excess marinade over turkey. Re-inject drippings after turkey is done for a super-moist and tasty turkey!